Diyarbakır today is a large Kurdish city of more than 1 million inhabitants located on the banks of the Tigris River in Southeastern Turkey. Most of the city has over the past 40 years grown outside of the old city encircled by a long wall made of black basalt. Within the five gates of this old city, many of the older houses made of the same dark stone stand in ruins next to the more recent and colorful shanty homes of more recent immigrants. Up until the beginning of the 20th century, there was a thriving Armenian neighborhood inside the old city. In 1915, however, the majority of its population was killed or deported, while the rest was forced to convert to Islam and hide its Christian identity. At the heart of this Armenian neighborhood stood the imposing Surp Giragos Church. Built in the 14th century, this church complex, one of the largest (perhaps the largest) in the Middle East, comprised chapels, a priest house, and a school. The white stones amalgamated sporadically amongst the dimmer blocks of basalt, a typical characteristic of the local urban architecture, create sharp decorative contrasts on the walls of the church. After 1915, the Surp Giragos Church and its associated buildings were converted into storage facility for textile. Almost half a century later, they were returned to the small Armenian community still living in Diyarbakır. At this time, however, many of the remaining Armenians had left to Istanbul and other western cities looking for better work opportunities. Slowly abandoned, the columns and arches of the church were no longer able to support its slowly collapsing roof. Nearly ten years ago, however, the Armenians of Diyarbakır living in Istanbul created a foundation and, under the auspice of the Armenian Patriarchate of Istanbul, began collecting funds for its restoration. 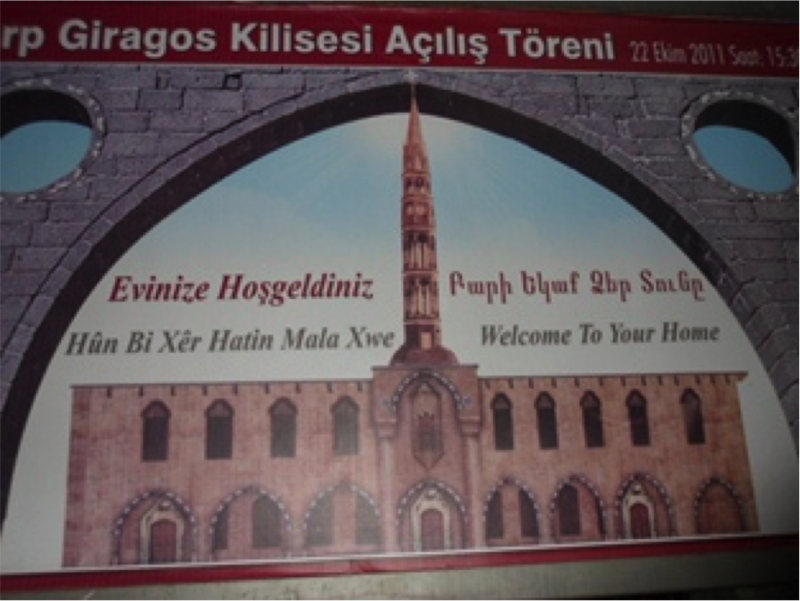 With the financial assistance of Diyarbakır’s Kurdish Municipality, the Surp Giragos Church was repaired and eventually reopened to the public on October 23rd, 2011. During the restoration work, a document was found listing 190 properties belonging to the Diyarbakır Armenian Church. A legal process was initiated in an effort to reclaim these lands and buildings. The procedure, however, turned out to be more problematic than expected since many of the places on the list no longer existed. Moreover, other buildings were already being used and much of the land that could have been returned already built on. Finally, the document itself was too old to locate precisely some of the names on the list. Because of these reasons, today, only 17 out of the 190 properties have actually been returned. Stepan Ilhan lives in Diyarbakır. He is the grandson of Haçig Ilhan, an Armenian who like him also lived in Diyarbakır. When the Surp Giragos Church opened its doors in 2011, he composed a song in Armenian to welcome it back to his city, to welcome it back to life. “Your bell rings again, can you hear it? Hello again to you Surp Giragos. How does it feel to come back to life? Diyarbakir and all of us, we missed you much. …you cannot recognize them, can you? … but we are their grandchildren. I am Istepan, the grandson of Haçig. Stepan Ilhan addresses the church itself in his song as if it were a real person with real feelings. He explains how the church, which has come back to life, is no longer capable of recognizing its visitors however. The song ends with the grandchildren of the ones the church was used to seeing welcoming back its church to life. And, just as Stepan welcomes back the church, the church also welcomes back Stepan. 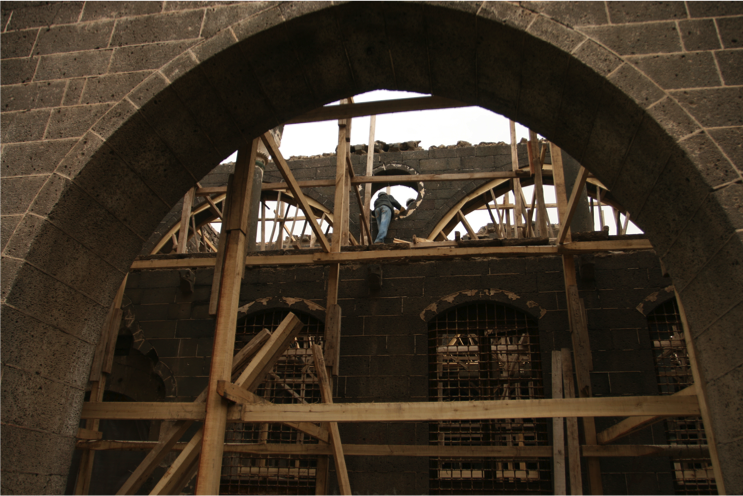 Restoring the Surp Giragos Church has made it possible for many of Diyarbakır’s “hidden Armenians,” that is the grandchildren of the Armenians of Diyarbakir who for their own safety were forced to convert to Islam in the beginning of the 20th century, to readopt their abandoned, but newly found, religious identity. As the church was being restored, these “hidden Armenians” began to visit the construction site, pray inside its broken walls, and, at the same time, question who they really were, and how their lives had been suppressed and silenced, almost erased, in the country they lived in. It is only once the restoration completed that these “hidden Armenians” were able to reaffirm their newly found identity, as if the physical presence itself of a monument had been a necessary step in the process. Recreating this place of worship triggered many “hidden Armenians” to question who they were as well as find ways to express it. Some converted back to a religion they knew very little about while others began learning Armenian in classes organized in the old city. By restoring the building itself, it allowed them to rediscover their hidden identities, and reveal what so far had been a hidden, very often painful, secret. Restoring monuments is always more than just about restoring things The resuscitation of the Surp Giragos Church illustrates the way people and things interact and can mutually affect each other. It also seems to offer the perfect success story. A building is reborn. A community is revived. Songs are sung and the tears of yesteryears are dried to allow the emergence of a bright “multicultural” future in Turkey. Of course, this is simply not true, and there is still a long way to go in terms of restoring the presence of Armenian culture and heritage in the collective memory of the Turkish nation. On the other hand, the Surp Giragos Church does offer a message of hope. First of all, if a restoration project like this is possible in Turkey today, it must mean that more restoration projects like this will be possible tomorrow. Second of all, as I have written above, restoring old stones is always more than just about restoring things. 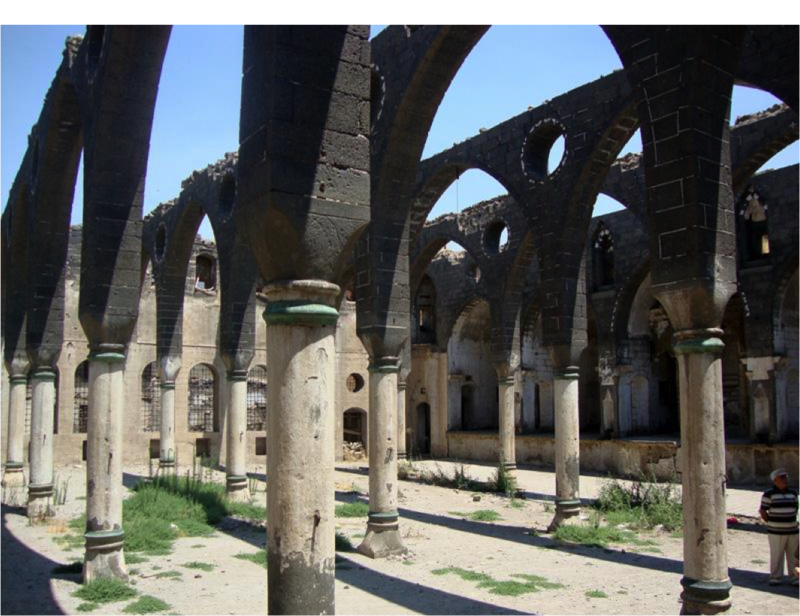 In this case, the restoration of the Surp Giragos Church in Diyarbakır has allowed, in the end, the recovery of erased memories, the reinvention of a suppressed identity, and, last but not least, the reestablishment of a broken community. Posted in Anthropology, Armenian Studies, Cultural Heritage, Ethnography, History, Memory Studies, Oral History, TurkeyTagged TurkeyBookmark the permalink.